In a press release today, NZXT unveiled their new Cryo E40 notebook cooler. The laptop dock is designed to cool laptops up to 15" in size and comes with a pair of 2x80mm movable fans. The fans can be repositioned thanks to a pair of laptop-safe magnets and can be focused on the laptop's hot spots. The notebook cooler also comes with a removable mesh that allows easy access for cleaning and the cooler's USB cord can be placed on either the right or left side to maximize flexibility. Expected to launch sometime in May, the Cryo E40 will cost $27.99. El Monte, CA – April 25, 2012 – NZXT, a company built on realizing the dreams of gamers worldwide, is proud to announce the Cryo E40 Notebook cooler for laptops up to 15”. 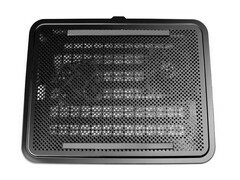 Cryo E40 employs a unique approach to high performance notebook cooling with 2x 80mm moveable fans that adapt to any laptop configuration. Featuring low-powered magnetic clasps designed to be safe around any piece of technology, users can easily adjust the positioning of the two fans enabling precise direction of airflow towards the notebooks most frequent hot spots. Cryo E40’s additional features include the ability to run the USB cable to either the left or right side for maximum flexibility and an easily removable mesh cover for quick access to your fans. All of this advanced cooling technology is packed into an ultra-slim, lightweight profile for easy mobile use while traveling or on-the-go.